There are only five Relais & Châteaux properties in all of Mexico; there are approximately 500 in the entire world. 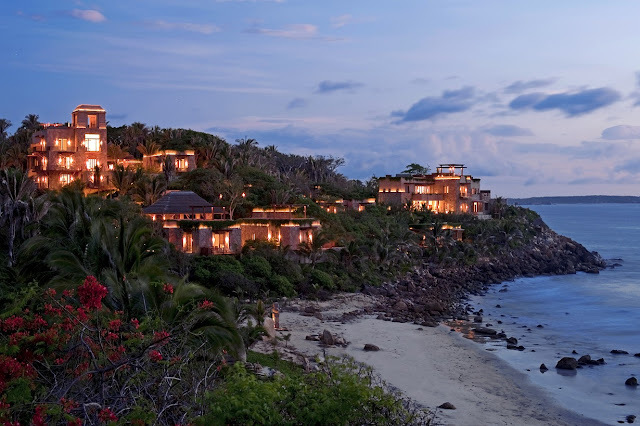 Imanta Resorts Punta de Mita is the only Relais & Châteaux property in the Riviera Nayarit. It has but 12 villa suites on an expansive property that takes up 247 acres (100 hectares) within the natural preserve of Sierra del Valleja in the town of Higuera Blanca. It’s not easy to define Imanta. If you look at it in the abstract it’s like a beautiful woman who must be treated delicately. It is definitely not a run-of-the-mill resort; it’s an organic property with an ecological architecture wherein the elements of origin still remain. Each space has an independent design; among the most stellar are La Casona Jaguar and La Casona de Los Templos, where celebrities such as Gwyneth Paltrow, Paulina Rubio and others who request extreme privacy have laid their heads, including European royalty from countries such as Holland and Norway, to name but a few. The Observatorio is one of the signature spots in Imanta. It provides guests with a spectacular view, a Jacuzzi under the skies and services for special occasions or, simply, for a drink with a side of sunset. The most romantic escape is named Romance at The Cliff, where the couple walks along to the melodies of three local musicians, which evolves in different stages with the sunset, the candles and unique amenities. The Jungle Spa, literally located in the jungle, is separated from the wilderness by the light walls of the palapa. It offers a Temazcal ritual (sweat lodge), Yoga in the Observatorio and a series of private tours. The hotel’s two restaurants, Tzamaika Ocean Grill and Tupika, serve haute cuisine created with organic local produce. The drinks are mixology blends that raise cocktails to a whole new level. The stonework is natural; each stone used is simply polished and creatively cut, though some are just placed as is. The “youngest” stone is a million years old; some have been on this earth for over 10 million years. In all of Mexico there are only five Relais & Châteaux hotels; there are only approximately 500 in the entire world.